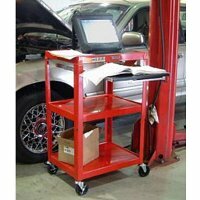 Compact steel mobile computer workstation with pull-out keyboard and mouse shelf. Unit is adjustable in 2" increments, and includes 3-outlet 15' UL and CSA electric assembly, 4" casters, 2 with locking brakes, and handle holes for easy mobility. 26" to 42" in height . Assembly required.